The arrival of Spring brings to the Florida Keys mild water temperatures and tarpon fever. This sickness inflicts the masses of anglers in pursuit of the Atlantic Tarpon (Megalops atlantica). These large prehistoric fish filter into the Keys and make their presence known by the sounds of screaming reels and screaming anglers. To increase your chances of catching the "Silver King" you can hire a professional guide (the easiest and perhaps most productive way) or venture out on your own. Catching one of these magnificent creatures on bait is not difficult but does require some local knowledge to make your trip a bit more productive. These large migratory fish average 80 to over 150 pounds! With such giants, the tackle used should include a stout rod and reel that will handle at least 250 yards of fifteen to thirty pound test. As the anglers experience increases, the size of the tackle decreases. For the novice, which this article is geared to, stick to the heavier stuff unless you don’t mind losing a few fish. In rigging up I will use a six foot leader made from an eighty pound hard monofilament such as Ande or Maxima. To one end of this leader, attach a swivel which is rated for at least the line test you are using. On the business end tie a 6/0 hook. A note on hook selection. I would spend a bit more and purchase one of the chemically sharpened hooks such as Gamakatsu and Owner. The mouth of a tarpon is an extremely tough place to get a hook into. The additional investment might just get that oversized herring to the boat for you. As an alternative, a Mustad 9175 carefully sharpened, should do the trick. Above the swivel attach a float just large enough to keep your bait from pulling it under. As far as choosing a bait, ask your local tackle shop. They know what has been producing since they’re selling it to the guides. The choices vary from mullet and pinfish to shrimp and crabs. The choice has much to do with water temperature and availability. Leave the bait selection to the tackle shop. The islands that make up the Florida Keys border many productive channels. These deep channels funnel millions of gallons of seawater each day between the Gulf of Mexico and the Atlantic Ocean. An enormous amount of baitfish and crustaceans is flushed through them each day. It is for this reason that the tarpon make their way into them to feed. Which channels to fish? Well, keep an eye out for the boats. They’ll tell you all you need to know. Before you run out into a pack of boats and throw your line in, take a moment to survey the scene and watch carefully. You’ll soon see a method to the madness. The boats catching the most fish are not aimlessly drifting around. There is a starting point to each drift as well as a "lane" to drift through. Watch carefully for signs of tarpon. A hooked fish is a sure sign, but look for rolling fish as they break the surface. Approach cautiously (read: SLOWLY) and take your position behind the other boats that have started their drift. Running through the maze of anglers only accomplishes two things. First it will ruin the tarpon fishing and second, it can make you A LOT of enemies. One last note on choosing a place to fish using bait. If you find a place where there seems to be a lot of people using flyfishing tackle, move on. The two types of fishing aren’t compatible with each other. Two of the hardest skills to learn in tarpon fishing are getting the hook set and keeping the fish hooked. The mouth of the tarpon is lined with a series of bones which can seemingly make hook setting impossible. Before you set the hook, be absolutely sure all slack is out of the line. This may involve lowering the rod slowly as the tarpon begins to move off with your bait or reeling in slack if he is swimming toward you. 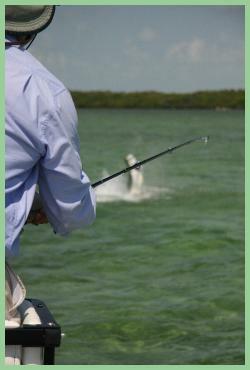 When the line becomes tight and you are just able to feel the weight of the tarpon, pull back hard and fast. I will usually have my clients do a series of three short, quick jabs before he begins his first run and aerial assault. Keep the rod tip up! At this point it is critical to pay close attention to the silver torpedo at the end of your line. 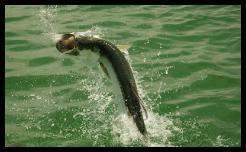 At the first sign that your tarpon might want to become a surface to air missile, bow to the King. No, don’t look to see if Elvis is fishing with you, what you do need to do is provide slack to the leaping tarpon. This is accomplished by lowering the rod tip at the fish, NOT by greeting the airborne fish by lowering your head and bending at the waist. Immediately upon his re-entering the water, get that rod tip up! For the novice tarpon fisherman this can be tough stuff to master and Capt. Bob Tiburzi provides these helpful thoughts: "More than any other reason, most tarpon are lost by yanking on the line while the tarpon is jumping. Never yank on the line while the tarpon is in the air!" His philosophy for the novice is "Don’t do anything, keep the tip up and stand still." Good advice for a tarpon first timer. With practice and a few fish, the aforementioned skills become second nature. In addition, keep a detailed fishing log. 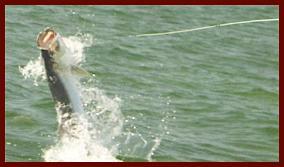 Current, time of day and tide all play an important part in successful tarpon fishing. Finally, take the time to release a tired fish properly. Remove the hook and keep the spent fish in the water. Removing them from the water and laying them across the deck is extremely stressful to the fish. With a gloved hand, hold its lower jaw open and face the fish into the current letting the water run through its gills. It may take some time but soon the fish will kick and swim off on its own to fight another day. After many years of pursuing these tarpon, I’ve given up on finding a cure for tarpon fever. I don’t believe there is one. 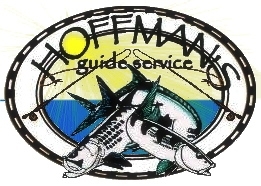 Specializing in sight fishing for bonefish, tarpon, redfish and permit on fly or light tackle.